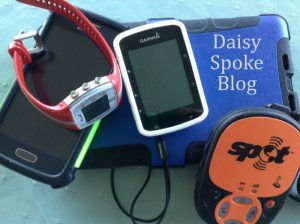 Technology and MTB: how DO you use that infernal gadget!? Ummm….. yep …. sounds like me, although I would not normally label myself “technophobe”. I might say I’m not very knowledgeable when it comes to technology, or that I’m more of a ‘people person’ and find technology less interesting. I definitely have shown a preference for other people to sort out my tech issues with computers, gadgets and other devices, and this mostly works fine because some people seem to really enjoy it. Or at least have a bit of an idea of what they are doing and can get the job done quickly. Technology and MTB have a pretty interesting relationship. Technology has enabled the development and production of amazing equipment – lightweight and strong bike frames, hydration packs, sweat-wicking kit, chamois and knicks that enable all-day riding, exercise nutrition, pocket-sized phone cameras, and GPS devices. Without thinking about the work that has gone into developing this and more, we tend to jump on our bikes every weekend or more often if we’re lucky, and hit the forest trails for our fix of nature and exercise. BUT … with all this technology are we really escaping modern life? So far, I’ve been content to let hubby navigate via his GPS because this enables me to focus on the environment (and staying upright on my bike). 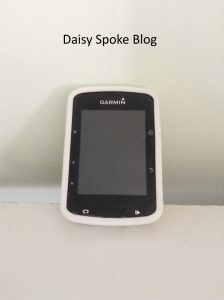 But recently I acquired a Garmin Edge 520, and hmmmm….. I have to learn how to use it. The first step being to find the on / off button, and decipher the teeny tiny icons that decorate the screen. Setting it up with my personal profile (“what …. why does it need to know how tall I am?”) and then being able to consistently turn it on, get to the application I want to use, save the ride, download it to an even bigger device and analyse the stats. Hmmmm …. 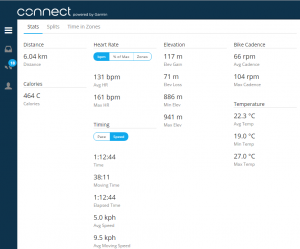 well, the first time I rode alone, I managed to successfully attach it to my bike, turn it on and select my training program. It only took half an hour(!) Yes, that’s half my ride time gone already. I heard that inner voice tell me I’m stupid, it’s stupid, whoever invented this was stupid, why don’t they make things with logical users in mind. I even had a thought about throwing it away! But I also heard ANOTHER voice tell me I just need to practise, get to know it, step into the space of being a learner rather than a technophobe, give myself time, take my own path to learning rather than expecting myself to follow someone else’s learning path. And what do you know?! This little infernal gadget was actually pretty fun to have on board! I got to challenge myself to work harder based on heart rate, distance, time and cadence. I got to save it, view my ride map and can compare my improvements over time. I can pre-set rides or follow maps as I go. I’ll be more confident to go on rides alone or with others who don’t have GPS devices (just in case getting lost comes into the picture!). Technophobe or not, it really doesn’t matter. If you have the desire to take something on board, you can, with persistence and practice; and create that extra bit of fun you didn’t know you could have! Life is unpredictable, and so is mountain biking! 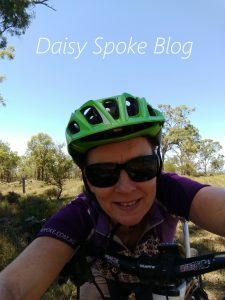 This is another life lesson that I’ve been reflecting on over the past few months as I’ve challenged myself in “My MTB Experiment”. My hypothesis was that I’d reconnect with the fun side of mountain biking by getting out on my bike more often, and so far it’s been proving itself correct! One of my discoveries has been that those things that freak me out on the trails (you know those things …. normal everyday features of nature like stones, sticks, tree roots, mud, sand and dust) really aren’t so bad after all. Sure they’ll always be there and I can’t do much about that, but I can change the way I react. It happens that these trail features have led me to feeling like I lack control of my bike, and I’ve actually fallen off a few times over the past few months and hurt myself. A few bruises and scratches and scrapes here and there is all part of the fun, like collecting souvenirs on a holiday. But then there was a chest injury from a heavy impact fall when I fell on a rotting tree stump, and a suspected broken toe from another tree stump. I don’t like falling off and I don’t like hurting myself. It’s scary, and ….. well, hurt-y! And it stops me getting back out exercising at my preferred intensity for WAY TOO LONG afterwards! Recently, as I’ve focused my attention on my body position whilst riding, I’ve become more mindful of my whole self. I’ve become more aware of my self in space, my thoughts, body feedback, and internal reactions when encountering unpredictable elements on trail rides. I’ve found that I’ve had time and space to take a breath in between noticing what’s going on and responding. With this time and space, I’ve been better able to choose my response rather than simply reacting in an instinctive way. So, for example, as my back wheel slips sideways because a stone has kicked out from underneath, I’ve been able to breathe and stay calm, keep my weight low and centred and focus on steering myself in the direction I want to go, and I know that my back wheel will follow me. Dealing with unpredictable trail features has also helped me to deal better with the unpredictable nature of life in general. 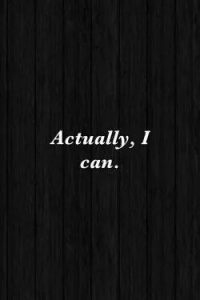 I’ve noticed that when various unexpected things have happened in life recently, I’ve been able to keep going calmly in the direction I choose, holding onto my power and control, refusing to be thrown by situations that I can’t control. BUT ….. I CAN control MY own responses. And that’s where the real power is! “Just relax!” The words are easily spoken ….. but how easy is it for you to do? I seem to learn all sorts of lessons about life on my MTB and vice versa. I have some trouble relaxing at the best of times, and this is definitely evident on my bike as well. I hold my upper body quite tense. 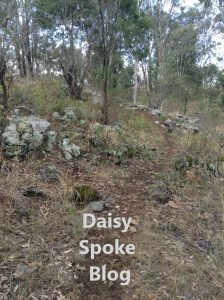 I’m easily spooked by rocks and sticks on the trail especially when the ground is dry and slippery like it has been this season until a couple of weeks ago when we got some beautiful rain that stuck the dust together. I get freaked out by tight corners and steep descents. All of these things are pretty common features on a trail ride so you can begin to imagine how tense I am by the end! So lately I’ve been practising keeping my upper body more relaxed on my bike. 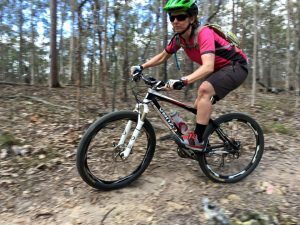 I’ve especially been trying to increase my awareness of my body position on the easier green trails so that when I ride the more challenging trails, I’m better prepared because of all the practising. I think it’s not only helped me to handle the trails a bit better, but also helped my shoulder and chest injury, as well as helped me to relax a bit more in other areas of my life. What a bonus! I’ve continued to ride my MTB several times a week for at least an hour since initiating My Great MTB Experiment. 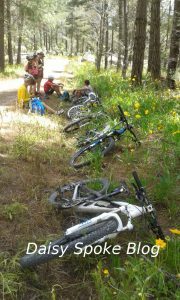 Weekend group and family rides have been longer, usually 3 hours or so. And, so, HOW AM I DOING NOW after quite a few weeks of persisting with regular practice? Well, thanks for asking! Yes! I am enjoying myself much more than I thought I would after finding myself in a veritable mental rut as far as summer riding goes. 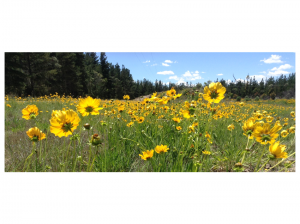 Whilst the summer temperatures and associated challenges continued, they’ve been less problematic than before. Fewer flies, hot temperatures rather than searing temperatures, and riding on open tracks rather than overgrown ones have all helped me to persist with regular practice. All this in spite of the various injuries from falls off my bike! Riding is feeling smoother and I’ve even been getting up a bit earlier (occasionally) to squeeze the rides into my day. As far as the mental challenge of enjoying myself, I’ve found it easier to hear my ENCOURAGING, SUPPORTIVE INNER VOICES and have found it easier to tune out from my inner critic. I’ve been MINDFUL of some of the smaller GAINS I’ve made which have collectively contributed to feelings of motivation. When I haven’t felt especially motivated I’ve tapped into my sense of COMMITMENT to myself (and this blog!) and to those I ride with. I’m focusing on PRACTICE, PRACTICE, PRACTICE and find myself looking forward to my rides and even …. (gasp!) … having FUN!